Mr. and Mrs. Moody with their granddaughters. 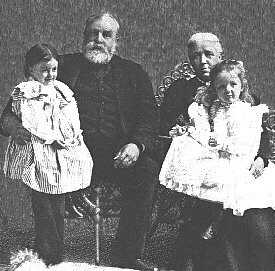 We read about Mr. Moody's early ministry in The Life of Dwight L. Moody by His Son, William R. Moody. "Gospels meetings were conducted during the week in a room formerly used for a saloon, but which had been made over unto a mission hall, and here Dwight L. Moody received the practice and training in preaching that were of such incalculable value in later years.
" And it seems that he needed this training, for he attained his powers of extempore speaking only gradually. It is of interest in this connection to know that when he first rose to speak in prayer-meeting one of the deacons assured him that he would, in his opinion, serve God best by keeping still! Another critic, who commended his zeal in filling the pews he had hired in Plymouth Church, suggested that he should realize the limitations of his vocation and not attempt to speak in public.
" ' You make too many mistakes in grammar,' he complained.
" ' Look here, friend, you've got grammar enough--what are you doing with it for the Master?' "
Luke 12:48 ...For unto whomsoever much is given, of him shall be much required: and to whom men have committed much, of him they will ask the more. (B.F.)Westcott loved to talk about missions, but that's where it ended. It was perhaps a sore spot to him that two of the century's most productive missionaries, C.T. Studd and Dr. W.T. Grenfell, were saved and called to the field right out from under his nose at Cambridge--and through the instrumentality of D.L. Moody, no less. Studd gave away an inheritance to take the Gospel to China, India and Africa while Grenfell decided against a lucrative medical practice to become a missionary to Labrador. In his autobiography, Grenfell said that he had been converted through Moody's common sense. After a young minister turned the opening prayer into an "oratorical effort," young Grenfell grew bored and restless and decided to sneak out. Moody spotted him and interrupted the prayer with, "Let us sing a hymn while our brother finishes his prayer." Delighted at the remark, the Cambridge student dashed back to his seat and was soundly converted at the sermon's close. From Final Authority by William P. Grady, p.239. "In the very midst of one discourse, and the height of its interest, two or three quickly succeeding shrieks came from the centre of the audience. Mr. Moody stopped as if at a signal, and, with Sheridan-like promptness, said: 'We'll stand and sing, "Rock of ages, cleft for me," and the ushers will please help that friend out of the hall. She's hysterical.' There were no more 'hysterical' demonstrations during the evening, and the congregation scarcely realized that there had been any interruption in the service." There were two men in England who Mr. Moody had a great desire to hear and meet -- Charles H. Spurgeon and George Muller, and with the twofold purpose of affording a beneficial trip for Mrs. Moody and making the acquaintance of these leaders in the Christian work, he went abroad. At that time he was unknown in England except to a few who had visited America. Among these were Fountain J. Hartly, secretary on the London Sunday-school Union, who invited Mr. Moody to speak at an anniversary meeting in Exeter Hall. It was customary for a speaker on such an occasion to be connected with a resolution, as its mover or seconder, in order to give him a right to the flor. Mr. Moody was therefore assigned to move a vote of thanks to the chairman of the evening, who in this instance was the well-known Earl of Shaftesbury. "'The chairman has made two mistakes. To begin with, I'm not the "Reverend" Mr. Moody at all. I', plain Dwight L. Moody, a Sabbath-school worker. And them I'm not your "American cousin"! By the grace of God I'm you brother, who is interested with you in our Father's work for His children. "That opening fairly took the breath away from Mr. Moody's hearers. Such talk could not be gaged by any standard. Its novelty was delightful, and Mr. Moody carried his English hearers from that time on." From Cambridge the evangelists went to Oxford. The mission opened on Monday evening, November 13th, with a general meeting in the Corn Exchange. The crowd speedily overflowed that building and more than filled the hall close by. As Moody began to read a chapter from the book of Ezekiel, some of the audience began to stamp and shout "Hear, hear!" Mr. Moody immediately closed his Bible, and rebuked them sharply. "You had better play with forked lightning or meddle with the most deadly disease," he said, "than trifle with the Word of God." From The Life of Dwight L. Moody by His Son, William R. Moody, p.353. "The third time that I went to assist Mr. Moody was in the fall of 1892. He had engagements to visit several of the larger cities of England, and afterward to hold an eight-day mission in Spurgeon's Tabernacle. He had been suffering for several days with a throat trouble which gave him considerable anxiety lest it should interfere with his work, so on our arrival in London, with his consent, I sent for Dr. Haberson, a prominent young doctor, afterwards one of Mr. Gladstone's physicians, who made a careful examination of his throat and lungs, and incidentally the action of his heart. Before leaving us the doctor took me aside and told me that he had discovered an irregularity in the action of the heart, asking me if he should tell Mr. Moody.
" 'Certainly,'" I said; 'he would wish to know of any trouble of that kind.' He informed Mr. Moody of his discovery, and after assuring him that there was no occasion for alarm, but simply necessity for caution lest he should over-exert himself, he expressed the wish that Mr. Moody would allow him to make an appointment for a consultation with Sir Andrew Clarke, one of the most celebrated authorities on such diseases, as he did not wish his own judgment to be relied on wholly in the matter. "Shortly before leaving London Mr. Moody saw Sir Andrew Clarke, driving immediately to the latter's office from a farewell breakfast given by Sir George Williams and a large number of other friends. After a thorough examination the physician confirmed the opinion of his friend regarding Mr. Moody's condition. "In reply to Mr. Moody's inquiry regarding what he had done to bring on the difficulty, and how he should avoid increased trouble in the future, the celebrated doctor inquired how many times a day Mr. Moody was in the habit of speaking. "And with these pleasantries the two men parted, the celebrated physician to continue his wonderful ministry of healing for little more than a year, while Mr. Moody was permitted to work for seven years, although with the consciousness that his summons might come at any moment." From The Life of Dwight L. Moody by His Son, William R. Moody, pp. 397-399.